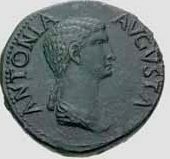 Antonia Minor, also known as Julia Antonia Minor, Antonia the Younger or simply Antonia (31 January 36 BC - 1 May AD 37) was the younger of two daughters of Mark Antony and Octavia Minor. 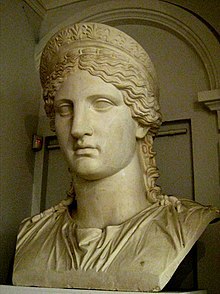 She was a niece of the Emperor Augustus, sister of Cleopatra Selene II, sister-in-law of the Emperor Tiberius, paternal grandmother of the Emperor Caligula and Empress Agrippina the Younger, mother of the Emperor Claudius, and both maternal great-grandmother and paternal great-aunt of the Emperor Nero. She was additionally the maternal great-aunt of the Empress Valeria Messalina and Faustus Cornelius Sulla Felix, the paternal grandmother of Claudia Antonia, Claudia Octavia, and Britannicus and the maternal grandmother of Julia Livia and Tiberius Gemellus. She was born in Athens, Greece and after 36 BC was brought to Rome by her mother and her siblings. Antonia never had the chance to know her father, Mark Antony, who divorced her mother in 32 BC and committed suicide in 30 BC. She was raised by her mother, her uncle and her aunt, Livia Drusilla. Due to inheritances, she owned properties in Italy, Greece and Egypt. She was a wealthy and influential woman who often received people who were visiting Rome. Antonia had many male friends and they included wealthy Jew Alexander the Alabarch and Lucius Vitellius, a consul and father of future Emperor Aulus Vitellius. In 16 BC, she married the Roman general and consul Nero Claudius Drusus. Drusus was the stepson of her uncle Augustus, second son of Livia Drusilla and brother of future Emperor Tiberius. They had several children, but only three survived: the famous general Germanicus, Livilla and the Roman Emperor Claudius. Antonia was the grandmother of the Emperor Caligula, the Empress Agrippina the Younger and through Agrippina, great-grandmother and great-aunt of the Emperor Nero. Drusus died in June 9 BC in Germany, due to complications from injuries he sustained after falling from a horse. After his death, although pressured by her uncle to remarry, she never did. Antonia raised her children in Rome. Tiberius adopted Germanicus in AD 4 (Suetonius Tiberius 15, Gai. 1., Div. Claudius 2). Germanicus died in 19 AD, allegedly poisoned through the handiwork of Gnaeus Calpurnius Piso and Munatia Plancina. On the orders of Tiberius and Livia Drusilla, Antonia was forbidden to go to his funeral (suggested, but not stated by Tacitus Annals 3.3). When Livia Drusilla died in June 29 AD, Antonia took care of Caligula, Agrippina the Younger, Julia Drusilla, Julia Livilla and later Claudia Antonia, Claudius's daughter through his second wife Aelia Paetina, her younger grandchildren. She outlived her husband, her oldest son, her daughter and several of her grandchildren. In 31 AD, a plot by her daughter Livilla and Tiberius’ notorious Praetorian prefect, Sejanus,was exposed by Apicata, the estranged ex-wife of Sejanus, to murder the Emperor Tiberius and Caligula and to seize the throne for themselves. Livilla allegedly poisoned her husband, Tiberius' son, Drusus Julius Caesar (nicknamed "Castor"), in 23 AD to remove him as a rival. Sejanus was executed before Livilla was implicated in the crime. After Apicata's accusation, which came in the form of a letter to the emperor, several co-conspirators were executed while Livilla was handed over to her formidable mother for punishment. Cassius Dio states that Antonia imprisoned Livilla in her room until she starved to death. When Tiberius died, Caligula became emperor in March 37 AD. 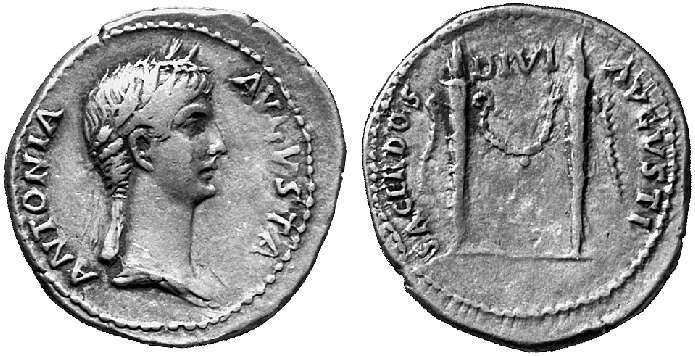 Caligula awarded her a senatorial decree, granting her all the honors that Livia Drusilla had received in her lifetime. 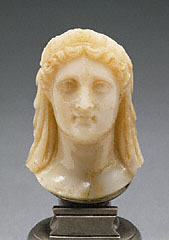 She was also offered the title of Augusta, previously only given to Augustus's wife Livia, but rejected it. Six months into his reign, Caligula became seriously ill. Antonia would often offer Caligula advice, but he once told her, "I can treat anyone exactly as I please!" Caligula was rumored to have had his young cousin Gemellus beheaded, to remove him as a rival to the throne. This act was said to have outraged Antonia, who was grandmother to Gemellus as well as to Caligula. Having had enough of Caligula's anger at her criticisms and of his behavior, she committed suicide. Suetonius's Caligula, clause 23, mentions how he might have poisoned her. When his grandmother Antonia asked for a private interview, he refused it except in the presence of the prefect Macro, and by such indignities and annoyances he caused her death; although some think that he also gave her poison. After she was dead, he paid her no honour, but viewed her burning pyre from his dining-room. Antonia died on 1 May 37. When Claudius became emperor after his nephew's assassination in 41 AD, he gave his mother the title of Augusta. Her birthday became a public holiday, which had yearly games and public sacrifices held. An image of her was paraded in a carriage. For more, see Nikos Kokkinos, Antonia Augusta: Portrait of a Great Roman Lady (London ; New York : Routledge, 1992) . Antonia is one of the main characters in the novel I, Claudius. In the television adaptation of the book she is portrayed by Margaret Tyzack. She is a loyal wife deeply in love with her husband Nero Claudius Drusus. However, she is unloving towards her son Claudius, whom she regards as a fool. Furthermore, after finding evidence that Livilla murdered her husband Drusus Julius Caesar and rightfully believing she was also poisoning her daughter for the same reason, she kills Livilla by locking her in her room until she starves to death. During the reign of Caligula she is so disgusted by the state of Rome that she commits suicide. She is a leading character in the novel by Lindsey Davis, The Course of Honour (1997), where she guides and advises Claudius and his supporters. In the 1968 ITV historical drama The Caesars, Antonia was indirectly mentioned by Tiberius (played by André Morell), who noted that Germanicus was a blood relative of Augustus on his mother's [Antonia] side. Colleen Dewhurst portrayed Antonia opposite Susan Sarandon as Livilla in the 1985 miniseries A.D.
^ Tacitus, Annales 4.44.2 and 12.64.2 may have confused the two Antonia sisters (of whom the younger is far more famous). The problem is even more complex: an even older Antonia was born to a previous wife of Antony, who married Pythodorus of Tralles, Dio 44.5.3, 46.38.52 App. BC 5.10.93. That daughter is properly Antonia Major (the Elder), and the subject of the article Antonia Tertia. ^ Barrett, A. A., 1989, Caligula. The Corruption of Power, 62. The date is derived from the Fasti Ostienses which states that Antonia died on the Kalends of May, 'K. Mais Antonia diem suum obit', supplied by Smallwood, E., 1967, Documents Illustrating The Principates of Gaius, Claudius and Nero, Cambridge University Press, no. 31, p. 28. Wikimedia Commons has media related to Antonia Minor.